You know what season it is, right? Exactly—a new season for original movies on The Hallmark Channel (“THC”). THC is my most favorite television network for modern romantic comedies and this year they’ve really upped their game with new releases of movies with an autumn theme. One of my favorite things to do when I have extended “me” time, besides write, is binge-watch television and lucky for me, there were three new Hallmark movies on this Saturday. I devoured all three of them and predict I will watch them again and again (and again), but I thought of something while watching that had never occurred to me before. Do not read the next paragraph if you do not want spoilers for Autumn Dreams or A Country Wedding (although, spoiler alert: both end with a happy ever after. It is THC after all). In Autumn Dreams, our hero Ben cancels his wedding at the last minute (literally the weekend of) to reunite with his teenage love. In A Country Wedding, the country star cancels his wedding to a famous actress the day before the wedding to declare his love to a childhood friend. As viewers, we root for these couples to get together, but what happened to the jilted fiancé? Was she heartbroken? Pissed? Did she eventually find love too? Ben’s successful fiancé seemed like she was used to getting what she wanted. Well, she wanted to marry Ben and that didn’t happen. And how would an A-list actress really react to being jilted at the altar? With her connections, did she shame her ex-betrothed all over social media and tell the public of his unimpressive “endowment”? It occurred to me, while watching these highly entertaining, feel-good movies, that while we see our hero and heroine blissfully in love, we never know (or care) about the love triangle loser. These small screen movies brought to mind jilted lovers in classic big screen romantic comedies. In Sleepless in Seattle, whatever happened to Annie’s allergy-afflicted boyfriend, Walter, after she ditched him for Sam? In You’ve Got Mail, did Kathleen’s ex-boyfriend, journalist Frank get together with the talk show host he flirted with on the air while attempting to save the Little Shop Around the Corner? Did Joe’s egocentric girlfriend Patricia go ballistic when he dumped her after they got stuck in the elevator? We all saw Joe and Kathleen kiss in Riverside Park and Sam and Annie lock eyes and hands at the Empire State Building on Valentine’s Day, but no one gave any thought to the lovers they left behind. I think someone should write a book about the love triangle losers. Perhaps I will add it to my “To write” list…unless someone beats me to it. I love to write—a good thing considering I’ve devoted a large portion of my life and my time to it. I also love to read, and despite not having a commute and preferring tv watching before bed to reading, I still manage to read approximately one and a half books a week. So, yes, I love to write and I love to read. What I do not like, however, is reading what I write out loud to others. It’s true—I’m not a fan of public speaking unless it is someone else doing the speaking in public. My second memory—the one that has haunted me ever since—was the oral report I had to do in Mr. Sherman’s social studies class in eighth or ninth grade. Kind of pathetic that I can’t remember which grade and makes me question whether I deserve the nickname my college housemates bestowed onto me for my amazing memory—Steel Trap. I spent hours preparing for this report, but my nerves were so shaky, I read it as if I was a contestant in a speed reading competition. When I was finished, the first question asked by a fellow student: “Can you repeat that?” All of my classmates, along with Mr. Sherman (shame on him) laughed while I ran out of the classroom in tears. In order to graduate high school with a Regents diploma, I was required to take, complete, and pass a semester of public speaking, which meant I had to get up in front of the entire class at least five or six times to present an oral report on various subjects including my biggest peeve (people who make too much noise when they eat) and a demonstration (carving a pumpkin). The class wasn’t until my senior year, but I started fretting in tenth grade. My writing skills (and those of my sister who actually wrote my amazing pet peeve report) garnered me an A-. Why not an A, you ask? Because I spoke too quickly and lacked showmanship. I’ve received this criticism many more times throughout the last couple of decades, specifically when I’ve written speeches/toasts for various weddings. The speeches are always impressive—I’m a writer; it’s what I do. But since I’m so concerned with getting it over with, I don’t give the toast as much as read it as fast as humanly possible. I don’t know why I don’t like speaking in public. I don’t have an aversion to being the center of attention sometimes, but I suppose I prefer it in a less formal way, like when there are no expectations of me. When I have twenty plus pairs of eyes on me, eager to hear what I have to say, and (at least in my mind) judging how I say it, it freaks me out. I remember when my boss asked me to say a few words about my experience during a client pitch, I rehearsed those seven lines over and over and over again. The pitch was via a video call and the clients could barely see my face, but did that ease my nerves? Of course not. My heart was beating triple time throughout the entire thing. The “thing” that lasted all of one minute. Since becoming a published author, offers to speak in public come more frequently and while I’m not required to give them in order to graduate high school, the more exposure I can gain for me and my books, the better. And so I always say “yes” when an opportunity arises. Earlier this year, I did my first reading at Barnes & Noble. I was equal parts stoked for a dream come true and horrified at reading an excerpt of my latest book out loud. On the advice of a few other authors, I marked up the portion of the manuscript I was reading with notes when to look up, when to emphasize, when to pause. It really worked. I did well, but I didn’t morph into a fearless speaker by a long shot. I spoke at a writer’s group through Meetup last weekend about my writing experience and my journey to getting published. I also gave the pros and cons of publishing with a small press based on my experience. I was seriously nervous, but I prepared by writing a speech and then transferring the major points onto index cards so that I would be able to speak more openly rather than read from a script. I rehearsed alone in my apartment numerous times. It was an informal gathering and I welcomed interruptions for questions by those in attendance. It went well and, in fact, I had a great time. I enjoy giving advice/guidance to writers aspiring to be published. I went to bed that night with a sense of pride that I stepped outside of my comfort zone as well as relief it was over. And then I woke up the next morning to an email from the president of Federal Toastmasters asking if I’d be willing to speak at one of their meetings—she wanted me to present on my experience with hybrid publishing. With a wave of dread, I knew immediately I was going to say yes. How could I say no? I’m not comfortable making decisions based on fear and know I would regret it if I did. 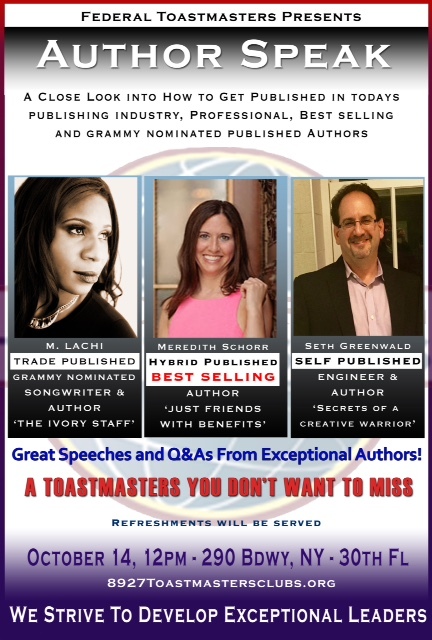 And so, on October 14th, I will be one of three authors headlining the Federal Toastmasters “Author Speak.” Will I knock them dead with my showmanship? Probably not. But I’m getting there.